We had actually watched the local staging of Waitress during its opening weekend thanks to an ARC promo but I guess things got way busier than expected since I somehow forgot to write about the experience. And given recent plans to cut down on my Geeky Guide blogging time I guess it's a good thing that I've been able to squeeze this review in. It's interesting how this musical has gained such a strong following since its release given it's based on a movie that may not be all that well-known even for a movie junkie like me. But stranger things have happened - just look at the likes of Hairspray, which was also based on a rather obscure cult classic film and yet became a Broadway success. This local production was definitely a lot of fun to watch and made for a lovely evening for me and Tobie. By the time this review comes out the show will be on its closing weekend and I can only hope that enough people got to enjoy the show when they had the chance. 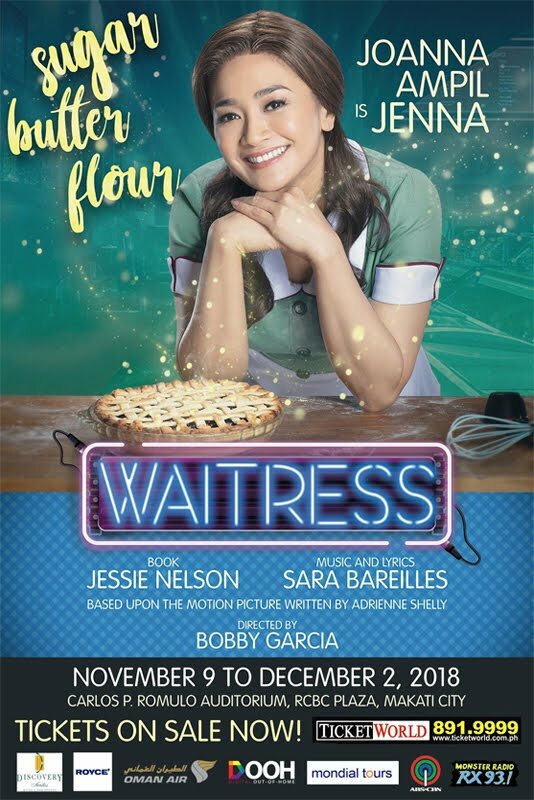 Synopsis: Waitress is a musical production with music and lyrics by Sarah Bareilles and a book by Jessie Nelson. The Atlantis production was directed by Bobby Garcia and was staged at the Carlos P. Romulo Auditorium at the RCBC Plaza in Makati City from 9 November to 2 December 2018. 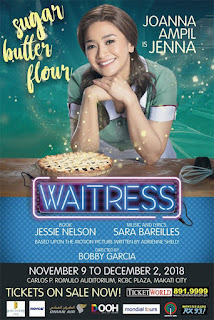 Jenna (Joanna Ampil) is a waitress and passionate pie baker at Joe's Diner. Her co-workers are fellow waitresses Becky (Bituin Escalante) and Dawn (Maronne Cruz) and their boss Cal (Dean Rosen). Jenna tends to compare the situations in her life to her pie making and often breaks things down into analogies for ingredients. And she has quite the pie in the oven this time when a pregnancy test shows that she's going to have the baby of her boyfriend Earl (George Schulze). As she gets herself checked out given her pregnancy, she meets Dr. Jim Pomatter (Bibo Reyes), who substitutes for her regular OB/GYN. Dr. Pomatter is clearly awkward around her for one reason or another and this blossoms into a complicated series of trysts given they are both involved with other people. At the same time Dawn gets setup on her first date when she is made to finally try online dating while Becky is clearly up to something but it's not immediately clear what that is. All the while we have Jenna wondering what to do with her life and how to deal with the new life growing inside her. What I Liked: They assembled some pretty solid talent for this production and Joanna Ampil is able to hold her own despite the likes of Bituin Escalante (who I LOVE) potentially stealing the spotlight. They were largely able to balance everyone's participation in the various scenes so that everything came together quite nicely. And that's major credit to the director, I suppose. And the result is a lot of great musical moments that had the audience cheering. The core relationship between the characters of Jenna and Dr. Pomatter totally worked out great on stage and I feel a larger part of that was because of Bibo Reyes' distinct portrayal. I've tried watching a few YouTube clips of other performances and I think I can safely say that he did a really good job of making the doctor as adorkable as possible and yet also oddly endearing. And special mention to the set, which was totally awesome. The turntable diner idea was an amazing use of a sort of classic theater trick that made for some really great transitions and surprise sequences. What Could Have Been Better: As seems to be a common problem in local productions, the audio levels for the play were all over the place. This was especially problematic during big ensemble sequences that had many characters singing but ending being largely unintelligible when everything got put together because the music track was too loud or the vocals were too weak. And that's a shame given the assembled team. Also, as much as I recognize the value of the actors working together to not overshadow one another, I think it was pretty obvious that Bituin Escalante REALLY had to hold back in many of her scenes, and that was a little sad. I wonder if there could have been a way to better utilize her raw power and musicality without needing to dampen her. But such is the theater life at times, I suppose. TL;DR: Waitress is a really fun musical and this local production was largely able to do it justice. It's definitely one of the theater highlights of the year and I hope you got a chance to see it. Thus the show gets a good 4 creative yet sometimes crazy pie recipes out of a possible 5.